Celebrate with your Greatest Of All Time with the creamiest, dreamiest cheese pairing around. 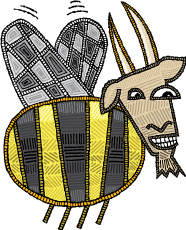 The hand-ladled, fresh City Goat cheese from Zingerman’s Creamery comes snuggled with a jar of Californian coriander honey, like two peas in a pod in our fun, illustrated gift box. The bright, tangy, fluffy cheese gets a hit of deep, rich, earthy sweetness from the honey. Together, the flavor is sweet-tart and supremely creamy.